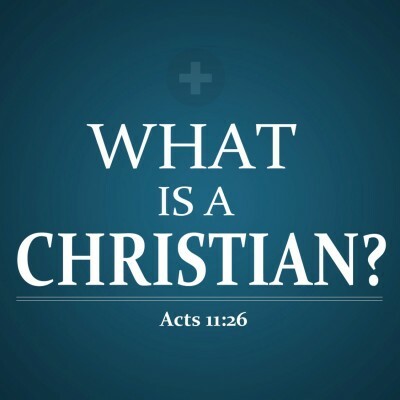 Home > Pastor's Blog > Christian > Are You A Christian? The phrase “Christian” is one that is heavily abused today. We say that we live in a “Christian nation”. Most people here in the south will proudly proclaim that they are “Christians”. But have you ever stopped and asked yourself, “What does it really mean to be a Christian?” I think we might be surprised by what it truly means to be a Christian. To be a Christian means that you are like Christ. In Acts chapter 11 the disciples were the first group of people referred to as Christians. These men were called Christians because they conducted themselves in a way that reminded the people in Antioch of Jesus Christ. Therefore to be a Christian you must be like Christ. So, that brings up a good question. What was Christ like? Jesus was a man who cared more about others than He did himself. Everything that Jesus did, He did for someone else. From the time that Jesus left heaven to be born in Bethlehem until the present, when He is seated next to His Father making intercession for the child of God. Everything He did was for others. When Jesus walked among men He confessed that there were times that he didn’t even have a place to lay his head, but when the multitudes came to hear Him teach and grew hungry He always found a way to feed them. Jesus was mocked, beaten and killed by an angry mob. Why, because He cared more for others than He did Himself. He cared more about your sins and my sins than He did His own personal wellbeing. Jesus went about to do good. Everywhere He went He was looking for someone to bless. Jesus was a shining example of how to care for the poor, how to reach out to a community, how to share the good news that is the gospel message. Whether it was healing the sick, feeding the hungry, teaching the ignorant, He always went about to do good. I could say so much more. Jesus was a man that had compassion. Jesus was a man who was willing to compromise when necessary, but unwilling to compromise when necessary. Jesus was a man who believed in hard work, paying your bills, being honest in business and helping your fellow man. So, this brings me to another question. Are you Christ like? Are you a Christian? Do you care more about others than yourself? Jesus was asked what the greatest commandment was. He answered that the greatest commandment was to love God with all your heart, but He quickly added that the next greatest commandment was to love your neighbor as yourself. Do you go about trying to do good? Could it be said of you that you are compassionate? Are you willing to compromise if needed, and at the same time unwilling to compromise on certain things? Do you work hard, pay your bills, and are honest in business? If you can’t answer yes to these things then you may not be as much like Christ as you think you are. Oh how we use that term “Christian” so loosely. Let me say before I finish that another characteristic of Christ was that He always had His priorities in the right place. When Martha complained that her sister Mary was not helping her with the house work Jesus answered that Mary had chosen the “good part.” You see, Mary was not working around the house because she was sitting at the feet of Jesus. On another occasion Jesus rebuked the Pharisees for complaining about the disciples. The Pharisees did not feel that the disciples were doing enough for the poor and needy. They felt they should spend more time working in the community and less time with Jesus. To this Jesus explained that the poor and needy would always be around, but He would not. It is possible to get so involved in helping others, working in the church and in the community, that we lose sight of what is really important. Jesus complimented the church of Ephesus in Revelation 2 for all their hard work, but also warned them because they were so focused on their work they lost sight of their love for God. It is sad when a church ceases to be a church and becomes a community outreach center. Yes, we are to help others, but that should never take the place of spending time with God. I know it seems like a fine line we are supposed to walk. Jesus said that the path that leads to heaven is straight and narrow. Fortunately we do not have to walk this path alone. Jesus knew that we would need help, so He promised that he would never leave us alone. I challenge you to examine yourself. Ask yourself the question. Could it be said you are a “Christian”?